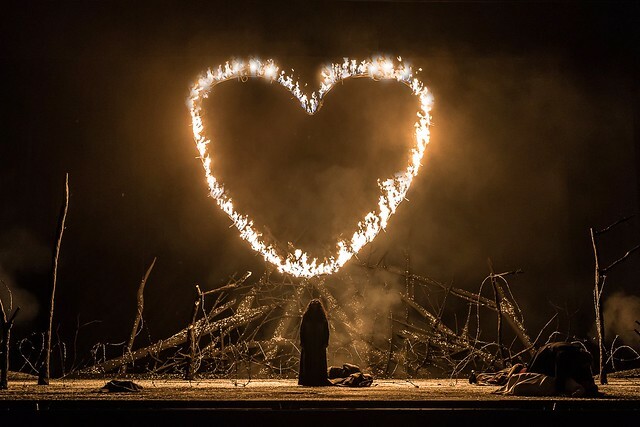 Giuseppe Verdi's fiery opera Il trovatore was live-streamed via the Royal Opera House YouTube channel on this page from 6.45pm BST on 14 July 2016, and was available for a further 30 days. The video has now expired, but you can still see extracts from the performance: watch the Anvil Chorus and Manrico’s aria 'Di quella pira'. Presented by Kirsty Wark, the stream took place alongside BP Big Screen relays of the production at venues around the UK. Despite its troubled genesis, Il trovatore is among Verdi's most highly regarded operas and features a dramatic narrative, reflective arias, impassioned duets and fiery choruses. It is famous for its 'gypsy' music, in particular the instantly-recognizable Anvil Chorus. The score's other highlights include 'Tace la notte', which shows Verdi's prowess not only in creating big tunes, but also psychologically rich music which drives the drama through expression of complex characterization. David Bösch's new Royal Opera production was much discussed by audiences after its premiere on 2 July 2016. His staging reflects on the piece's themes of jealousy, revenge and love by setting the action in a hauntingly beautiful, wintry landscape that has been riven by war. Read audience reactions to the production. The new staging featured an exciting cast that included Lianna Haroutounian as Leonora, Italian tenor Francesco Meli as Manrico, Serbian baritone Željko Lučić as Count di Luna and Russian mezzo-soprano Ekaterina Semenchuk as Azucena. Acclaimed conductor Gianandrea Noseda conducted the piece that he describes as 'the kind of music that arrives directly to your heart'. Tickets go on sale to Friends of Covent Garden on 21 September 2016. General booking opens on 18 October 2016. Thank you Royal Opera House. Excellent news. Looking forward to the live-stream. Thanks John, the text has now been updated. Thank you for this. I will be interested to watch this cast, having seen the other team last week. Can I ask if this will be available on catch-up for a time afterwards, as Nabucco was? Il trovatore will be available on demand via YouTube for 30 days after the live stream. roh productions were once shown live in a string of European cinemas .. in the case of Il Trovatore this does not see the case (my choice movie theatre would be in Basel, Switzerland). Has this practice been discontinued? Very exited to watch the Live Opera from Ottawa Ontario Canada!!! Thank you! Please, forgive me for asking maybe a stupid question, but this is my first time on ROH live streaming. What does "on demand" mean? Is it no longer free of charge? And, anyway, how could I "demand" ? Not stupid at all! On demand means you are able to watch it, whenever is convenient, by clicking on the play button on the YouTube video on this page. The stream is available for 30 days. It is free! Hope you enjoy the performance. Very excited to watch the Live Opera from Ottawa Ontario Canada! Thank you!!! Amazing work for the first act. Bravo, amazing and breathtaking performance! We had the pleasure to attend this spectacular opera performed by the (also excellent) other team of main singers and are enjoying this one too - different but also appreciated. The production is sympathetic : love and art surviving a context of war and crime. Thank you. This production is very powerful, especially on the background of current situation in the world; war and violence make everyone unhappy, even those who initiate it, who are so called victors! This message has been made extremely clear by this production. Love the darkness lit by fire in its every form, big paper flowers and a butterfly resting on a barb wire...Singing is superb. Bravo! Is there still any possibility to access the on-demand video? I was in the audience in the Royal Opera House on 14 July, and that very performance represents for me a personal memory. Unfortunately, when I spotted the video on Youtube in July, I had not seen the 30-day availability notice, so when returning there tonight I understood there was a deadline and I missed it. Thank you for your comment, I'm glad you enjoyed the performance. Unfortunately, due to rights agreements, we can only share the performance for 30 days - although we can offer you the 'Anvil Chorus' in full. Are there any plans for the Royal Opera to launch a subscription on demand service similar to the Met Opera On Demand, and Digital Concert Hall? I think it is long over due. Thanks for your comment. We are working on improving our on demand services. There's no update at the moment, but please do follow our Twitter and keep an eye on our website, as all announcements will be made there in due course.